Clock, radio, bookshelves, telephone, storage drawers, outlets for electrical appliances, and other conveniences are provided in the novel bedroom unit shown in the photograph at the left. 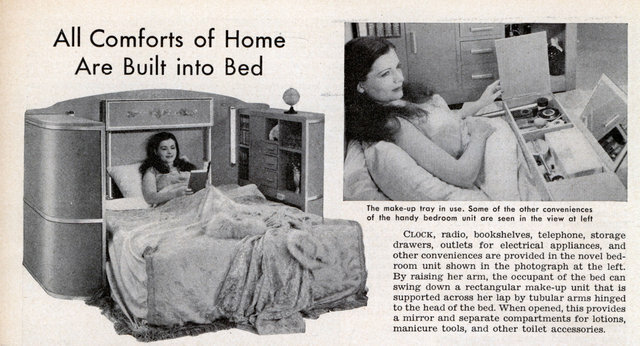 By raising her arm, the occupant of the bed can swing down a rectangular make-up unit that is supported across her lap by tubular arms hinged to the head of the bed. When opened, this provides a mirror and separate compartments for lotions, manicure tools, and other toilet accessories. As a bloke you must forgive my ignorance, but would women really want to slap on the old war paint while still in bed? Remember in the “good old days” women were supposed to obsess over how they looked because that was the only value they supposedly had to their husbands. I have friends whose mothers told them never to let their husbands see them without makeup, even in bed. That’s right; you stayed up until he fell asleep, then you went and washed your face. And then you got up before him and made up your face before he awoke. Makeup aside, this would be very handy for someone who was bedridden.